For some Canadians, B.C has always been home. For others, it is a new place to set down roots. In either case, carving out your own little piece of paradise can be hard work. Picking out a commercial or residential property is easy but taking care of it afterward is not. That is why the Gorilla team is expanding! Property owners of the West Vancouver and Lions Bay communities can rest easy knowing that, Vincent, our newest franchisee partner, is nearby! Owning a home or storefront is a big commitment and a lot of responsibility. Managing the interior is difficult enough but adding on exterior issues makes an even bigger pain. Now, some of these services, you might expect or even plan for, like snow clearing and salting. Everyone knows that winter is on its way but mapping out how to handle what comes along with it is tricky. Leave the planning and follow through to our Gorillas. While some property issues can be expected, others come out of left field. Graffiti might appear overnight but our graffiti removal makes sure it is removed just as quickly. When it comes to the aesthetics of your home, our Gorilla technicians can cover any exterior surface. Whether it is hard like concrete or wood or fragile like glass, our pressure washing and window cleaning services have got you covered. Standing still doesn’t do much to get the job done and that is why all of our Gorilla technicians like to keep moving. We have no problem climbing skyward for your roof cleaning and moss removal or to clear out those blocked gutters. 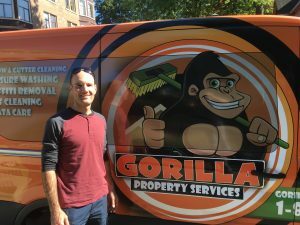 When your property needs a bit of a ‘pick-me-up’, there is no one better qualified than Vincent and his team of Gorilla technicians.